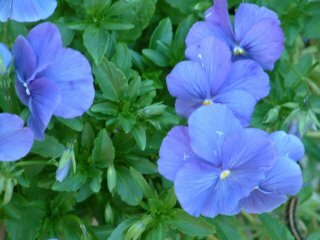 When I took a walk around the neighborhood last night, I noticed that pansies and mums are starting to appear in garden beds and containers. Maybe it's a little early for around our area (zone 7), but with motherhood only 3 weeks away (more or less) it probably is a good idea to get ahead of the game this year. (Not to mention that my zinnias are still pouting a bit, so I'm eager to compost them.) So I'll probably be off to the garden center this week. Pansies and violas in containers are my favorites for winter color. Both are considered "hardy annuals" in zone 7, and they will even recover from an occasional freeze and keep on blooming. The plant in the picture above survived the ice storm of 2004 on my front porch. The frozen flowers faded, but new ones cropped up soon enough. New tip for pansies to try this year- When deadheading, which is essential for repeated flowering, I hear that pinching back the top couple leaves will help keep a the plant bushy. Pansies and violas are the staple winter color plants around here, but of course there has to be more! Earlier this year I went to a lecture on winter color in the garden. Since I was raised in a state where the landscape was frozen solid for the winter, the concept of gardening for the winter season fascinates me. The speaker, from Daniel Stowe Botanical Garden, was really into the lenten rose, or Hellebores. Has anyone had luck with these, or recommend another winter bloomer? I never thought I'd be so excited to see some animal munching up my plants. 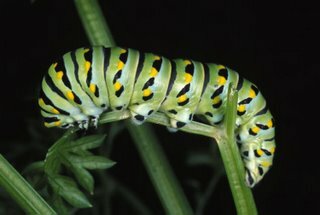 But when a second crop of caterpillars arrived this month, I was honored that they would dine on my fennel. 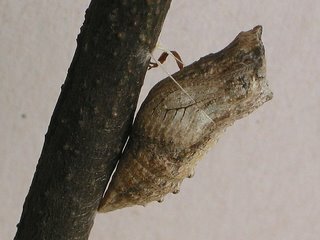 My efforts at gardening for butterflies seems to have finally paid off! The butterfly was still wet-winged and struggling, so I moved it to a sunnier, safer spot. 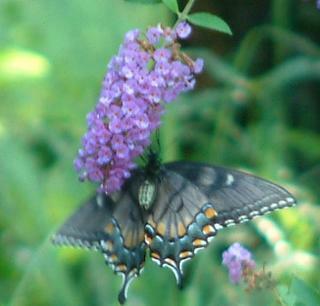 I hope it survived to flutter around like this Eastern Black Swallowtail I photographed last summer.